It only takes one night of poor slumber to be reminded of how essential proper rest is to your wellbeing, and curating a healthy sleep schedule can be a great way to balance your lifestyle. But not everyone loves the idea of diligently recording a sleep log every night, so AI-powered sleep trackers are becoming increasingly popular. 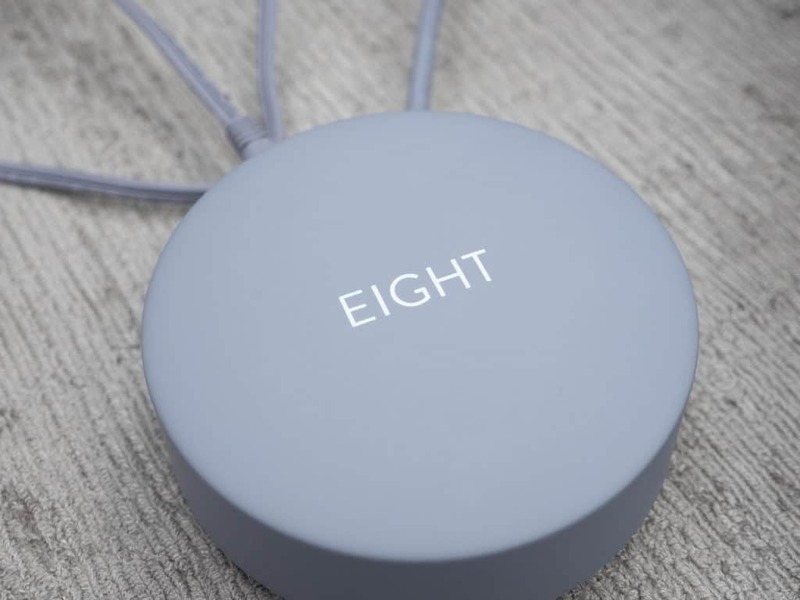 Sleep technology company Eight built a tracker designed to calculate your nightly “stats” so that, every morning when you wake, you’ll know how you slept (and how your habits can improve!). In this review, I’m going to explore all the ins and outs of “smart sleeping” with the Eight Sleep Tracker. I’ll show you how to set it up, how it works, and who might benefit the most from this innovative sleep accessory. Don’t worry if you don’t have time to read my full review, you can click here to skip to the summary. Monitor your sleep habits for the best rest possible with the Eight Sleep Tracker! So before you can enjoy all the benefits that “smart sleeping” has to offer, you have to set your Sleep Tracker up! But, you’ll be glad to know that set-up is relatively simple (even for those of us who are a little less tech savvy). 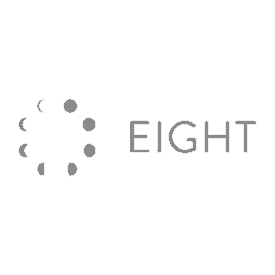 Before you even remove your tracker from its box, you’re going to download the Eight App to your phone. It’s compatible with any iPhone that’s 4S or later, as well as select Android devices. And downloading the app couldn’t be easier; you just go to eightsleep.com/getstarted. It will then prompt you to download the app to either the Apple store or Google Play and that’s it! You’re off to the races. Then, you just launch the app and follow the easy on-screen instructions. And if you’re sharing your Eight Sleep Tracker with a partner, set yourself up first and then the app will prompt you to invite a partner to join at which point they can put in their information as well. Once the app is all set up on your phone, you’re ready to dig into the goods! I like to remove all the sheets and blankets from the bed before I commence with the unboxing for a more seamless set-up. So, what’s in this big purple box? Well, you’ll find the hub and connector cable, the power cable, the sleep cover and, of course, a user manual. And that’s all! I do like how straight forward the set-up is in that there aren’t a ton of moving parts. Once the contents of the box are out and ready for action, place the sleep cover directly over the mattress and then put your sheets overtop of it. 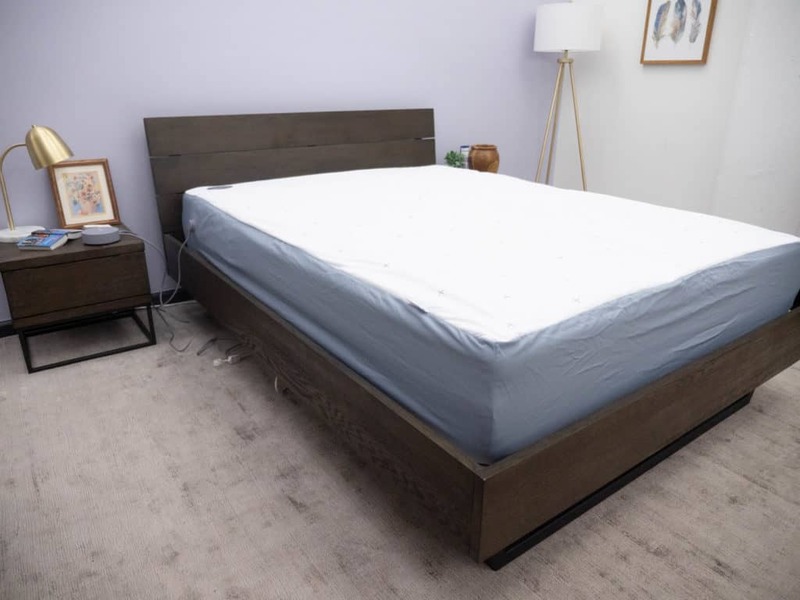 For the purposes of this review, I’m using Eight’s Mars mattress, but you can cover any mattress with the Eight Sleep Tracker as long as it’s a compatible size. What I mean by that is, if you’ve got a Queen size mattress, you’re going to want to get a Queen size sleep cover. After that, just plug the power cable into an outlet and wait for the hub to start blinking blue. Once it’s blue, you know your Eight Smart Cover is ready for action. 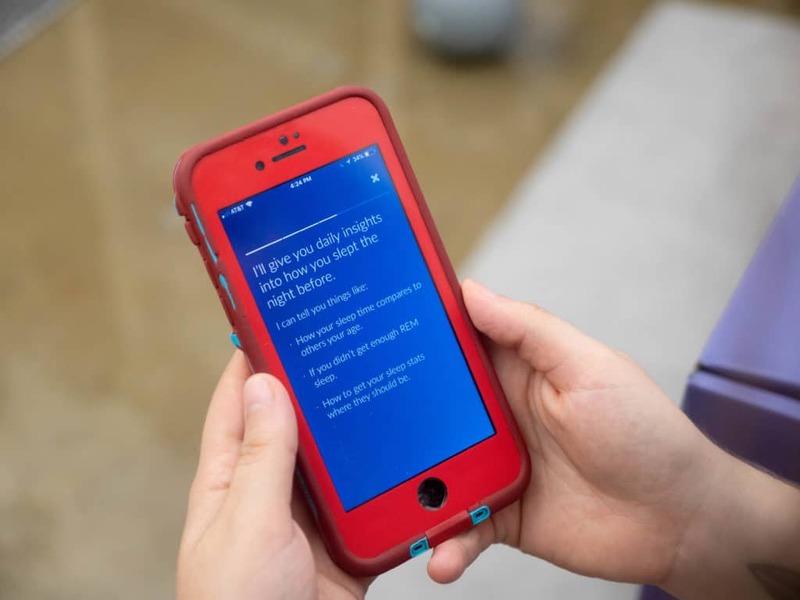 Some more very easy on-screen instructions will then pop up on your phone, asking you to put in your home’s wi-fi password so that your tracker and your phone are all synchronized. Once you’re app is set up and your sleep tracker is all connected, you’re ready to get into some smart sleeping! WHAT’S THE SLEEP COVER MADE OF? 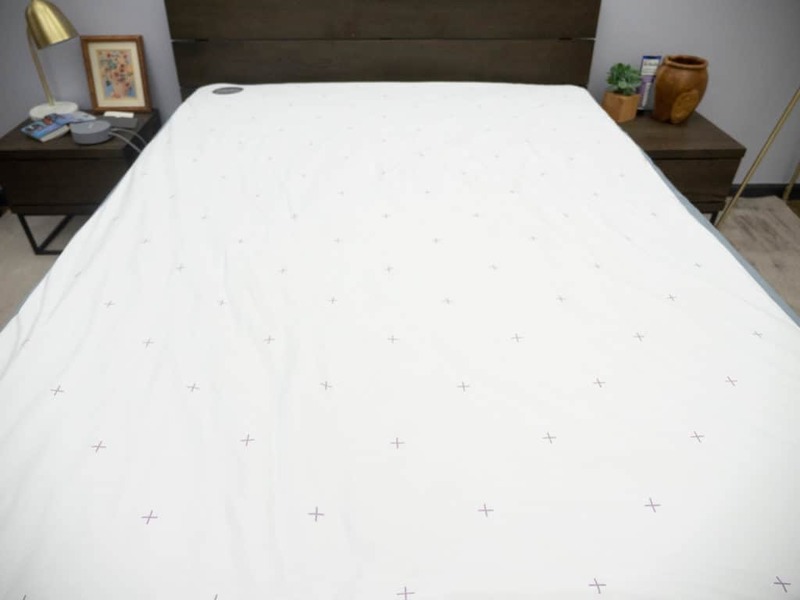 The Eight Sleep Tracker (also called the sleep cover), itself is made from 100% polyester and offers a small bit of cushion between you and the mattress. While it won’t be in direct contact with your skin, it’s got a nice soft feel to it, and it’s not a noisy material at all. I was pleased to discover that you can barely feel the sensors inside the cover, and I didn’t find them to be obtrusive in any way. Not to mention, polyester is a moisture-wicking material, so that’s going to help keep your cover fresh. Elastic bands ensure that the cover fits securely around the mattress and won’t shift during the night. Typically, your sleep cover will rest on top of the mattress and be tucked away beneath your fitted sheet, so the polyester cover does add a slight but pleasant extra layer of comfort. But it’s inside the sleep cover where things really get interesting. HOW DOES THE EIGHT SLEEP TRACKER WORK? 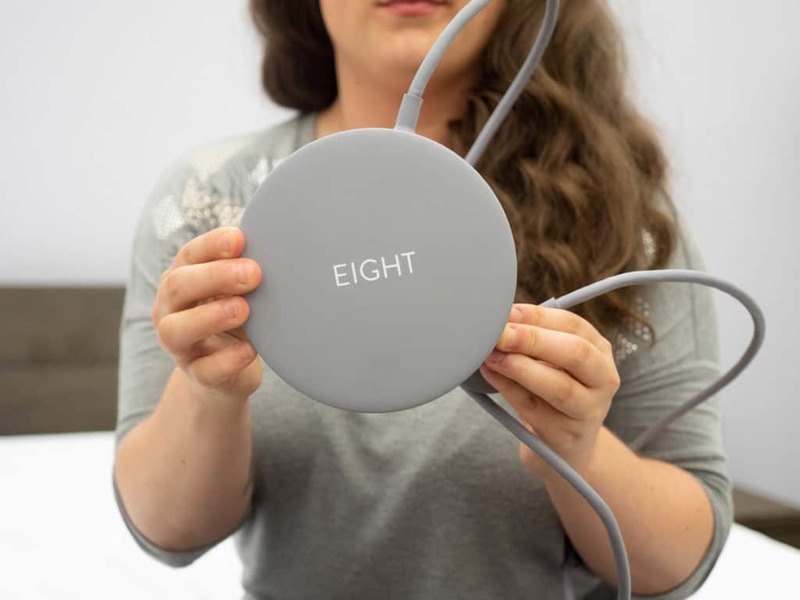 Inside the Eight Sleep Tracker are piezo sensors — wi-fi enabled technology that tracks your sleep every night. After you’ve set up the Eight App and your sleep tracker is connected, the sensors essentially turn your bed into a “smart” mattress. And these sensors are designed to track everything from heart rate to REM sleep, so that your smart mattress can learn and record statistics about your bedtime habits. Every morning when you wake up, the App will be waiting to give you a Sleep Score — a number based off of myriad factors surrounding your slumber. The home screen will always show your score and how long you slept the night prior. But if you click “see stats”, you’ll find the breakdown of the factors listed above accompanied by either pink exclamation points or green checkmarks. The pink exclamation points mean that that particular sleep habit could use a bit of improvement, and the green checkmarks mean that things are looking good. And Eight gives you the option to click on each factor, which will lead you to a longer description of what each one means. As you continue to scroll the dashboard, you’ll find more information about your heart rate, breathing rate, bed temperature and room temperature. Essentially, the sleep tracker records the nightly averages for each of those factors — this way, you can get a sense of comparison for each night. Furthermore, if you click “show events” on the dashboard, you can see a line graph featuring a very detailed, almost minute-by-minute report of your heart beats, the times you woke up, and how often you tossed and turned. After you’ve seen your Sleep Score and learned all about your nightly averages, scroll back to the top of the dashboard to access your “sleep coach.” A relatively new addition to the Eight app, the AI-powered sleep coach is designed to make notes and recommendations about how to improve your sleep. The sleep coach points out patterns that you might not have otherwise noticed (like you always sleep worse on Thursdays or that you get your best sleep when you call it an early night). 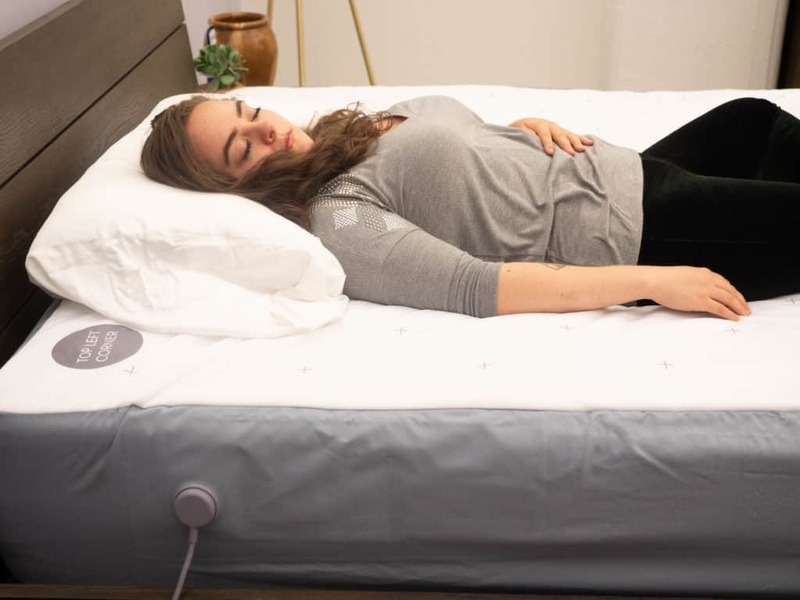 It will let you know when you spent an above-average amount of time tossing and turning, and encourage you when you’re on a healthy-sleep roll! The Eight sleep coach records nightly data and provides you with tips (or “insight”), but it also lets you know how you’re sleeping compared to others in your demographic. The coach uses location, age, gender, and other identifiers to help sleepers relate to the habits of their peers so that they can see how they rank. As I mentioned, you have the option to include a partner when setting up the Eight app, and if you do, their data will show up as well. Along the bottom of the Eight app, you’ll see six little icons: a house, thermometer, clock, music note, meditator, and a grid. The house icon is (you guessed it) your home button. Tap that, and it will always take you right to your dashboard. And your dashboard is your sort of base of operations for navigating the app. The thermometer icon is for temperature control. Using a scale of 1-10, you can warm both yours and your partner’s side of the bed. Each side of the sleep cover has its own warming setting and you adjust them separately. So, if you’re looking for a neutral or slightly warm temperature, set it to 1 or 2 (or even turn it off), while your always-cold sleeping partner cranks their side up to a very toasty level 10. In my experience, it took no time at all for the cover to warm up (maybe 10 minutes) no matter the setting I chose. You also have the option to set a timer so that the warming effect will turn off while you’re asleep so you don’t wake up sweating! The little clock icon is for your alarm clock which you can use like any alarm clock you’ve ever used… or you can use the “smart alarm” feature. After you set your alarm clock, switch on the toggle for “smart mode” and the alarm will offer to wake you up during your lightest sleep cycle either 15 or 30 minutes prior to the time you set. This way, instead of being forced out of REM, the alarm will ease you out of light sleep. The alarm clock offers a range of soothing sounds such as “sunet” and “tranquility” to wake you, and the sound comes from your phone — not the sleep cover. Then there’s the little music note icon. This feature allows you to play white noise, nature sounds, and other ambient sounds that might help lull you into dreamland. And as usual, you can set a timer so that it plays for as long as you like. There are 11 sounds total, including the usual suspects such as ocean waves and white noise. Another feature designed to help you drift off can be accessed by clicking the little meditator icon. A seven-day series narrated by Anne Douglas offers guided meditations to help you relax before you fall asleep. Each meditation is about five minutes long and can be activated through the app regardless of where you are. So, if you’re traveling away from home and need a little help getting to sleep, the soothing voice of Anne Douglas is but a click away. Lastly, the grid icon is for setting up your smart home. First you have to go to IFTTT.com and create an account. Then, just go back to the app, click on the trigger you are interested in (for example, “Start brewing coffee while Smart Alarm is snoozing”) and then log into the IFTTT account again. All that’s left to do from there is hit the “on” button, and you are all set! Depending on how your smart home is set up and which devices you have, you can do things like tell Alexa to warm your sleep cover and adjust your smart thermometer to change the temperature of your bedroom. First of all, I feel like I should make a confession: I am not a very tech savvy person. So, I do tend to shy away from devices with the word “smart” attached. That being said, I was pleased to find that the Eight sleep tracker was pretty easy to use! 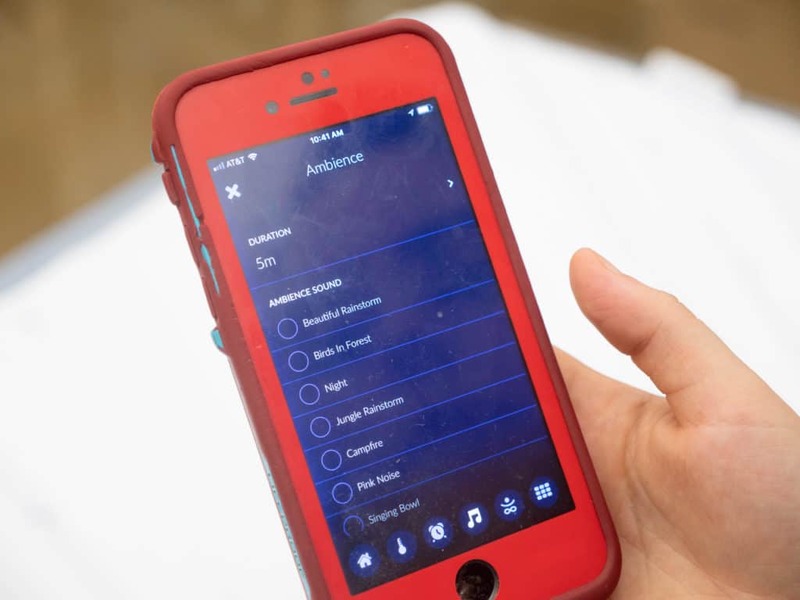 The Eight app provides users with very straightforward on-screen instructions that were simple for me to follow, and all that’s left to do after everything is connected is… sleep! Once my phone, my mattress, and my sleep tracker were all in happy synchronicity, I covered the tracker with my sheets and got into bed. I knew there were piezo sensors inside the cover, and I kind of wondered what it would feel like to sleep on top of them. Honestly, in my experience, you could feel them a little bit — but barely. You really have to press into the mattress and sort of search for them with your hands in order to really feel them. Personally, I was not bothered by the feeling of the sensors beneath me at all, but it’s worth mentioning that the sensors are not completely unnoticeable. Lying in bed, I browsed the features of this app and thought: why not use them all? I warmed one side of the bed all the way up to 10 (the hottest level) and set the other side to zero (and I may have had a little too much fun rolling back and forth between temperatures). Then, I set my smart alarm to wake up during my lightest sleep cycle within 30 minutes before my set time. And I picked an alarm tone called “love crisp” because it had a calming sound (and a cool name). I didn’t want to have the “ambiance” and the mediation series playing at the same time, so after sampling snippets of all the ambiance options (like “campfire” and “windchimes”), I moved over to the meditation icon. The euphonious timbre of Anne Douglas’s voice was enough to make me drowsy within moments, and my only complaint about the meditation series is that there are only seven days’ worth. I don’t have a Smart Home, so I didn’t use the IFTTT feature but I was awestruck by the Eight app’s option to command your coffee to start brewing while your Smart Alarm is snoozing. Fiddling with all of these features was as fun as it was educational, but there was one thing that dampened my experience a little bit. I like to enjoy a cup of tea and a bedtime snack while I’m in bed (guilty pleasure) and because I knew the sleep cover cannot be washed, I was too nervous to try it. It certainly didn’t ruin my experience using this tracker by any means, but knowing that there is no way to ever wash it did make me a little on edge. I think this could be a very useful sleep accessory for just about anybody. It made me feel very on top of my sleep health (pardon the pun) knowing that this tracker was working in so many ways to improve the quality of my bedtime routine. And because it’s so easy to use, I felt like it’s something that I could monitor consistently without having to do much else aside from get in and out of bed. Pretty interesting stuff! Unwashable — Because of the piezo sensors inside, the sleep tracker must not get wet at all. This means, of course, you cannot wash it. So, you’ll have to be extra diligent about keeping it clean, and you may even want to cover it with a mattress protector. 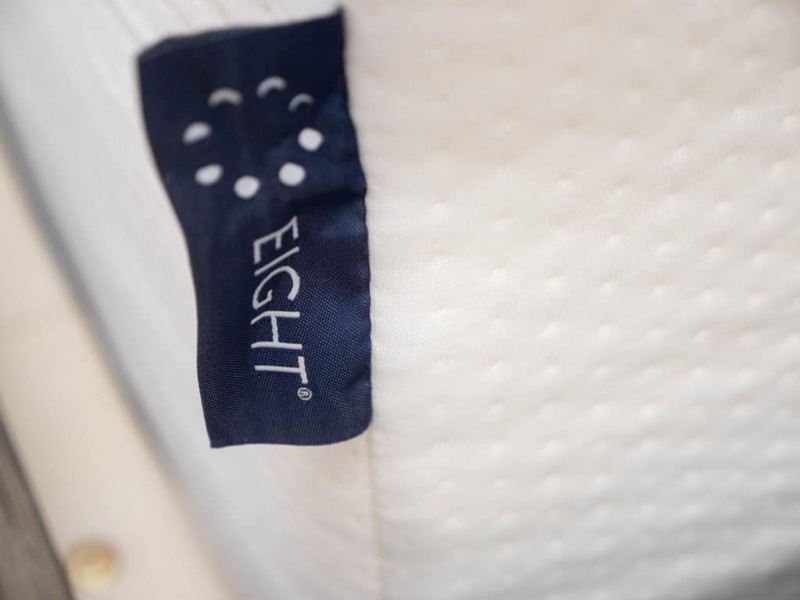 Although, the folks at Eight suggest that covering the tracker with a protector could affect your sleep scores. Warming Only — The warming feature of this tracker is great, but there is no cooling feature as of yet. Because cooling your body temperature helps you to fall asleep, it would be ideal if the tracker offered both. However, you can sync the Eight Sleep Tracker to your smart thermostat (if you have one) and change the temperature of the room using the app on your phone. Internet Glitches — At the end of the day, it is wi-fi enabled technology you’re sleeping with and the internet is never glitch-free. Because this sleep system relies on wi-fi, losing connection even temporarily could cause you to lose the sleep data you had been tracking. The good news is, every Eight sleep tracker comes with a 1 year warranty, so if it comes with any material defects, they have you covered. SHOULD I TRY THE EIGHT SLEEP TRACKER? Sleeps Cool — If you’re someone who can never have enough blankets in bed, you might love the warming feature of the Eight sleep cover. 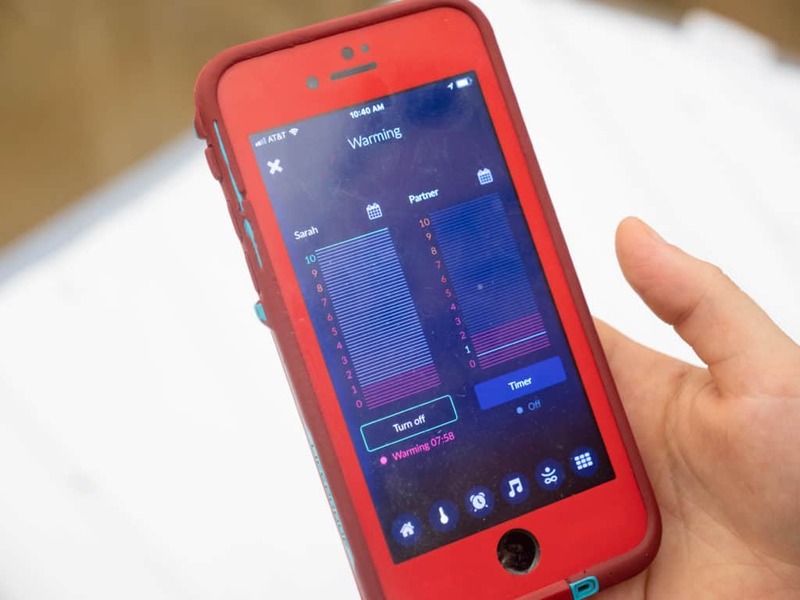 Using the app on your phone, you can warm one or both sides of the tracker on a scale from 1 to 10 (depending on how toasty you like your bed to be!). Keeps a Sleep Log — If you are trying to get in the habit (or improve your current methods) of keeping a sleep diary, this sleep tracker could be a very useful tool for you. 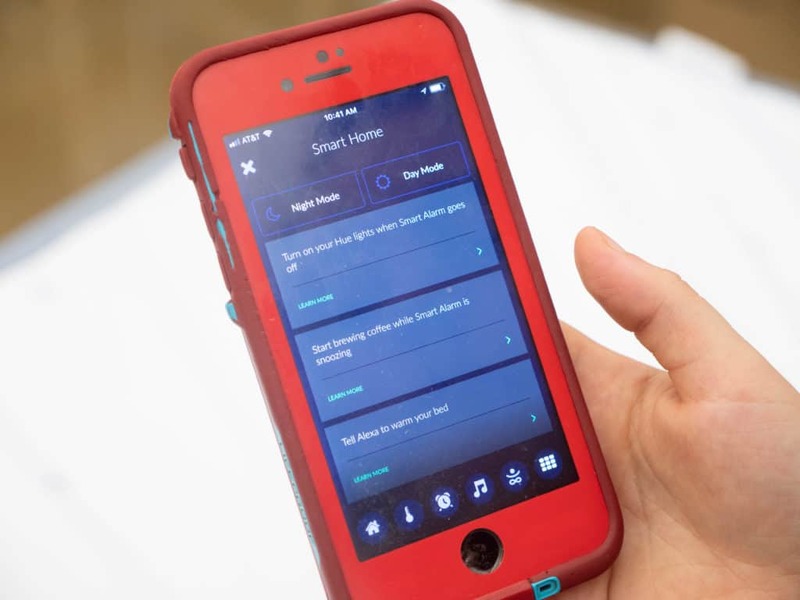 You’ll have access to a very detailed description of your nightly sleep health, and it’s all automatically stored on your phone so you don’t have to write anything down. 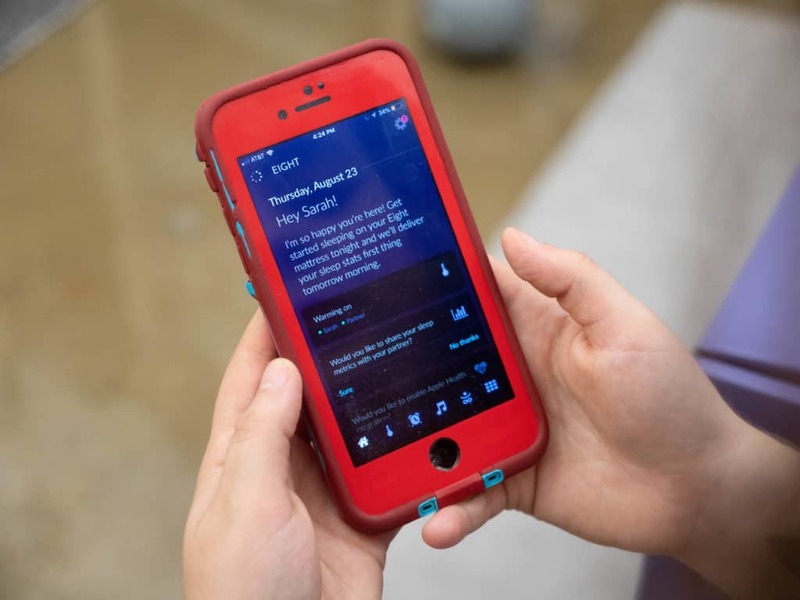 Needs Help Falling Asleep — The Eight app includes several calming features such as “ambience” and “meditation” programmed specifically to help you fall asleep. You could explore a deep, restful state with some guided meditation, or play sounds of the rainforest until you drift off. 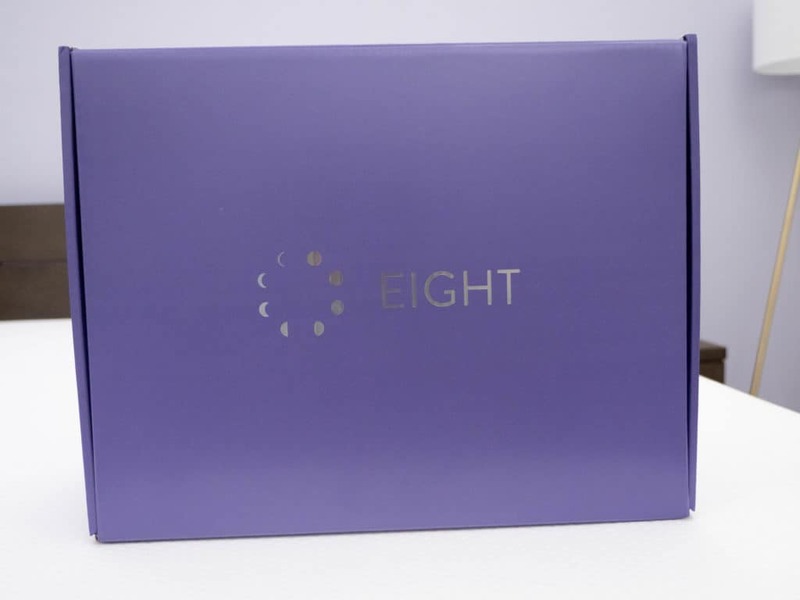 Head over to Eight Sleep to get your new tracker!